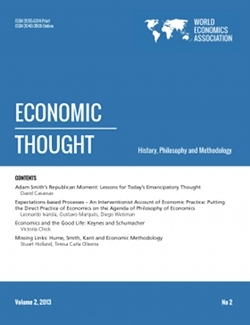 Economic Thought is an open peer-review journal brought to you by the ground-breaking World Economics Association. We publish papers on the history of economic thought and economic history, methodology of economics and philosophy of economics. Through this and other print and on-line journals and conferences we work to support and advance interdisciplinary research that investigates the potential links between economics and other disciplines, as well as to provide contributions that challenge the divide between normative and positive approaches - with an emphasis on original and path-breaking research.